There was a chill in the late November air, but only warmth in Ashley Reaves Linden’s room in the cancer ward on Tuesday, Nov. 27, when Joe Newberry, one of Ashley’s favorite bluegrass musicians, stopped by to sing her an early Christmas carol. “Snow falls round the manger, love melts it away, greet the host of angels, on this Christmas day,” he sang, strumming his guitar by her bedside, her parents and friends gathered ‘round for the surprise concert. 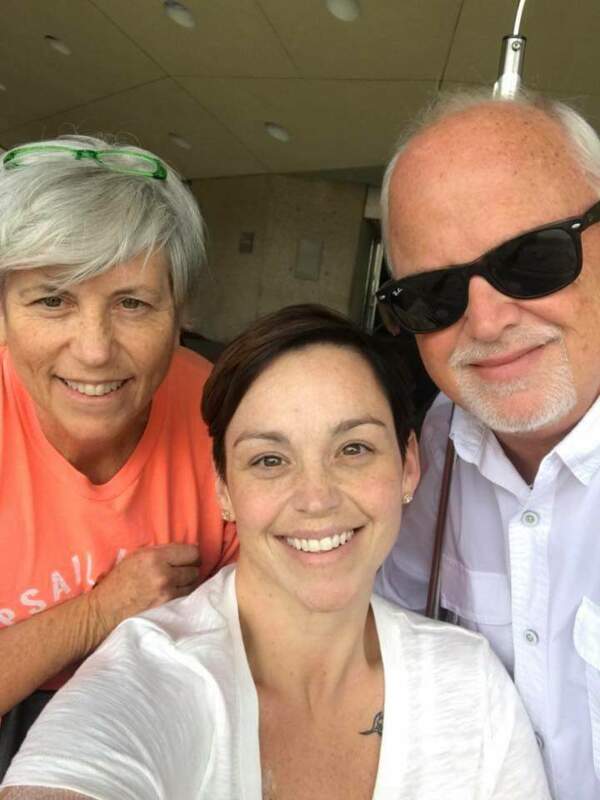 Ashley had been in hospice care back home in Raeford, North Carolina, with end-stage neuroendocrine (NET) cancer, when she was rushed to Duke Saturday, Nov. 24, with dangerously low blood pressure and severe dehydration. Throughout her illness, Ashley’s been there for her kids as much as she can — whether at home or school, on the soccer field or wrestling matches, at violin lessons, doctors’ appointments, and everything in between. As cancer has increasingly weakened her, she’s leaned more on her mom, dad, and friends for support and care. “I know they’re getting scared now, even if they don’t show it, which just breaks my heart,” Ashley says, tearing up in her room in intensive care on Friday afternoon, where she’s been since Wednesday night. “If I’m crying or I’m sad, my children will tell me, “Mommy, you’re going to a better place”… My youngest even says the streets are going to be gold. It takes a lot of courage and guts for them to say that to their own mother who is dying. I've been telling them ”When mommy's not here you can always talk to me and I will hear you."" 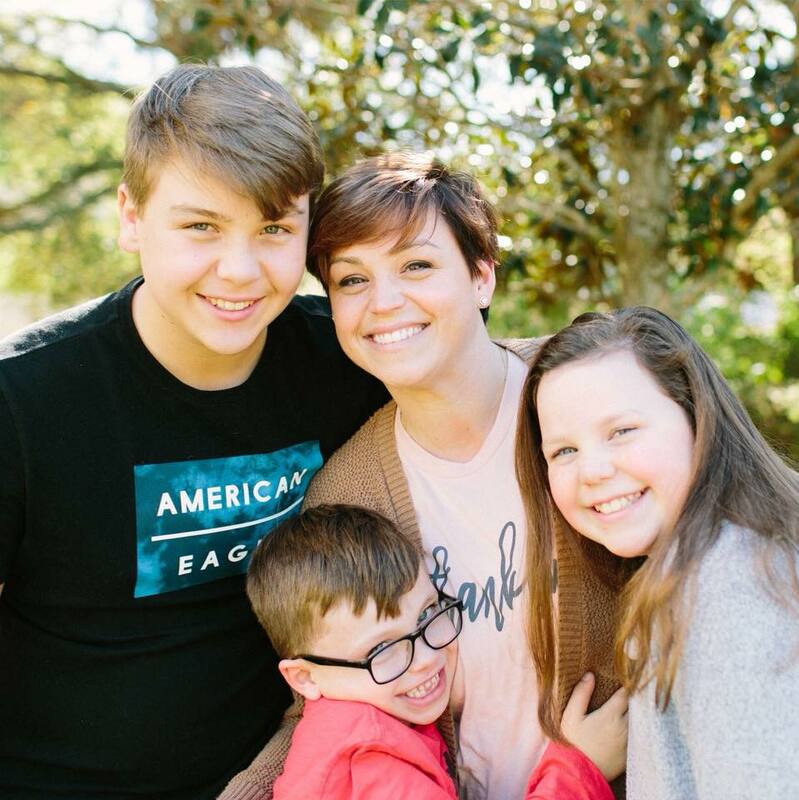 A couple years ago, while on disability (due to cancer treatments) from her job as a home appraiser, Ashley was looking for new ways to bond with her children. They started painting together — first birdhouses, then when they ran out of birdhouses, rocks. On the white stones, which were plentiful in her backyard, they wrote the word “hope” or references to scripture, like Psalm 22 or Jeremiah 29:11. She left the first one at Applebee’s and hid the second one and many more after that in and around Duke Cancer Center and the hospital. On the backs of the rocks she wrote “Follow us on Facebook at #TeamAshley;” encouraging each rock-finder to share news of their discovery then pay the kindness forward by hiding the inspirational rock for someone else to find. Cancer patients — from the newly diagnosed to terminal — and their caregivers wrote her about how finding the rocks lifted their spirits and gave them hope. Many strangers became her friends. This past summer she shared her story with WNCN-TV and WRAL-TV and left several rocks in the WRAL studio garden. Ashley’s face brightens when you talk to her about her “rocks of hope” that have so far traveled to every continent, except Antarctica. As her rocks, more than 1,000, continue to make the rounds, other people have been moved to paint their own motivational rocks. “People say I’m a bright light in a dark world,” says Ashley. Teri explains how she and her daughter “try to find the good in everything” including the “blessings” that have come from cancer. And even on this day when Ashley is in intensive care, they find things to laugh about, like how Ashley talks when she comes out of sedation. “I hate being depressed; I don’t have time for that,” says Ashley. And she adds that she was only able to realize her dream of enrolling her children in private school this year by cashing in part of her life insurance policy. She said she just feels “blessed and happy” to have them all in one school and thriving. Ashley’s neuroendocrine cancer has ravaged nearly every organ in her body, despite the tireless efforts of Duke doctors and nurses through the years. She’s been through ten different kinds of chemotherapy treatments, one regimen of immunotherapy, and multiple surgeries. 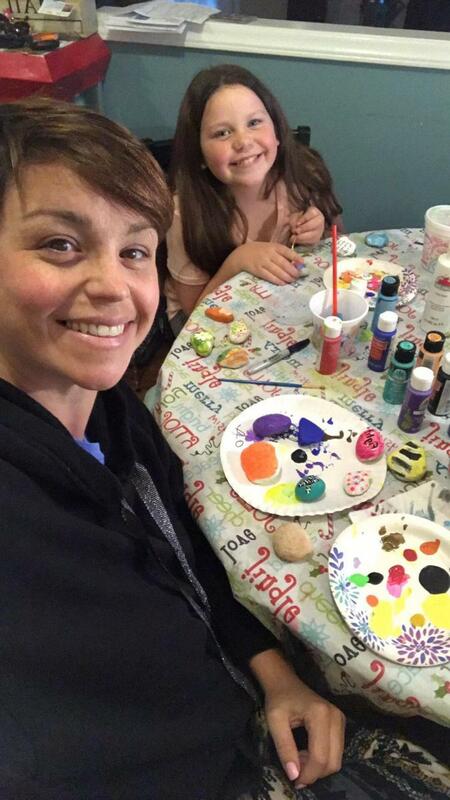 This past October, Ashley’s Aunt hosted an end-of-life party for her in Fayetteville. Various musicians, including Joe Newberry, came to play. People stood up and shared their memories of Ashley, and a big family photo was taken. And there’s one more request — a public invitation to the Pour House Music Hall in Raleigh on Saturday, Dec. 15, to “party with me and some amazing bands.” And no doubt, her ever-widening circle of love. 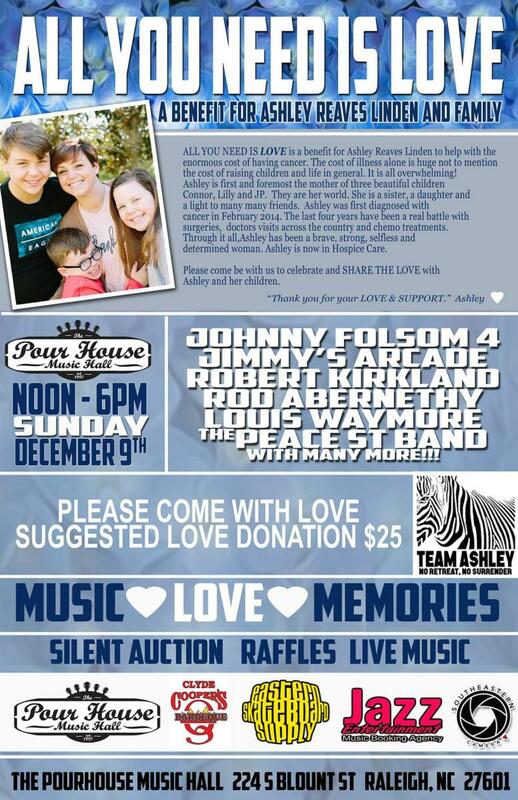 The benefit concert — All You Need is Love — is billed as an event to help Ashley and her family with “the enormous costs of having cancer.” It will be held from noon to 6 p.m. on Sunday, December 9, at Raleigh’s Pour House Music Hall (224 Blount St., Raleigh). There will be a silent auction, raffles and live music, with a suggested donation of $25, to celebrate and “share the love.” Sponsored by the Pour House Music Hall, Clyde Cooper’s Barbecue, Eastern Skateboard Supply, Jazz Entertainment Music Booking Agency, and Southeastern Camera, the featured bands include Johnny Folsom 4, Jimmy’s Arcade, Robert Kirkland, Rod Abernethy, Louis Waymore, and The Peace Street Band. CIRCLE PHOTO (TOP): Ashley Reaves Linden holds one of her "rocks of hope." FRONT OF BLOG PHOTO: Ashley Reaves Linden and her mother Teri Holliday. UPDATE (JANUARY 21, 2019): Ashley Reaves Linden passed away on January 20, 2019, at home, surrounded by her children and family.